We already know 600 employees are getting the boot, which is like the writing on the wall in blood and now WoW is giving out the goods. If you come back you will not only get a flying mount so you can sit in your major city with 20 other fools running around on it. 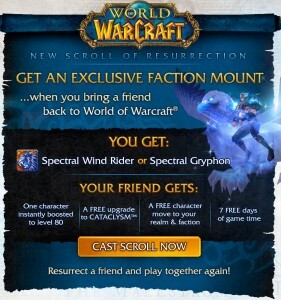 But if you bring back a sucker, I mean friend with you get a free level 80 character, a free upgrade to a Cataclysm-enabled account that allows access to all of the game’s current content and 7 days of free play time.